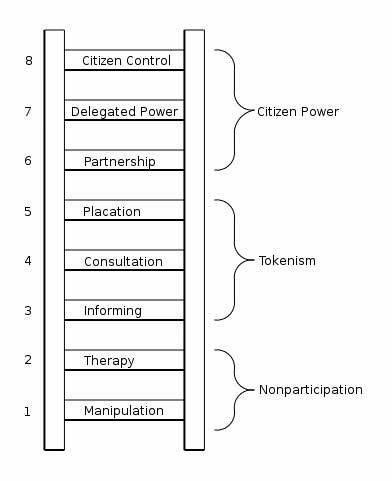 One of the most powerful models for thinking about how much influence people have in public programmes is Sherry Arnstein's Ladder of Participation, developed 25 years ago. Her eight rungs range from Manipulation to Citizen Control. I developed a version for The Guide to Effective Participation, but could never find an online reference for the original. However, it is now available in full as web pages and downloads. 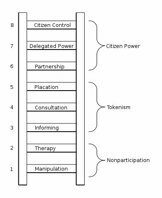 I think that the ladder (left, click for larger) remains a useful way of thinking about power and control, though participation programmes are more complex these days. Back in the 1960s it was usually a matter of one civic power holder - council or agency - considering how much 'say' they would give to citizens. These days there is almost inevitably a complex partnership of interests, who may not agree among themselves. The result is often that promises are made about high levels of engagement, but the reality drops down the ladder. When I amended the ladder I suggested that it was not really a matter of the higher up the ladder the better, but rather horses for courses. There's more explanation of the idea of stance here). Sometimes consultation on fixed options would be appropriate, sometimes a partnership among stakeholders, or support for key interests. Unfortunately things seldom work out that cleanly, and I think that Sherry may have been right to include terms like manipulation and therapy in her model.